NOTE: The Hi Flow model was discontinued in 2014. The following instructions are only for this model. For instructions on molding the current X Type model click here. Since the customizing of the SeaCure mouthpiece takes place before mounting on the regulator, please read all of the following instructions carefully and completely before proceeding. Unlike conventional mouthpieces, the SeaCure mouthpiece must fit your mouth and jaw configuration precisely. Therefore, it has a specific top and bottom position. Most people’s upper teeth are slightly forward of their lower teeth when the jaw is closed. (See Figure A). 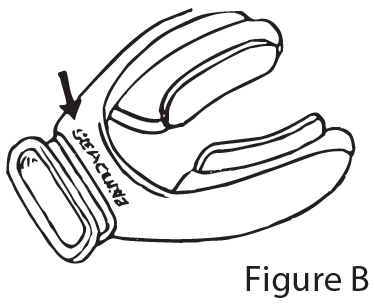 If your bite is this way, the surface of the mouthpiece imprinted with the word “SeaCure” (See Figure B) should be positioned facing UPWARD, both in the molding process and in mounting the mouthpiece to your regulator. 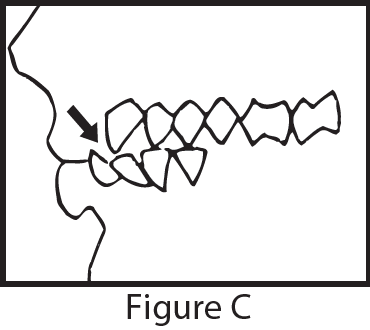 However, some people’s lower teeth extend in front of their upper teeth when the jaw is closed (See Figure C). If this is true for you, the SeaCure imprinted surface of the mouthpiece should be positioned facing DOWNWARD for both molding and mounting. Note: This positioning is very important for maximum comfort and effectiveness when diving! 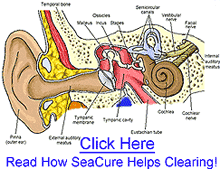 Note the position of the word SeaCure. Having determined the proper positioning for your jaw, try your SeaCure mouthpiece in your mouth just to get a feel for how it goes in. AT THIS POINT THE UNIT HAS NOT BEEN MOLDED AND WILL NOT YET FEEL COMFORTABLE. You will note that, unlike conventional mouthpieces, SeaCure extends back to include all of your teeth. 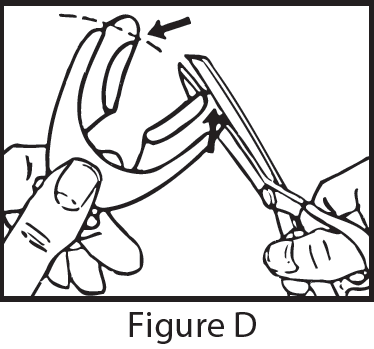 If the bite wing tips touch the back of your mouth behind the last teeth, take a sharp pair of scissors and trim off a small portion of each bite wing tip (See Figure D). Note: Cut off only about 1/8th inch of the tips at a time! Retry the mouthpiece in your mouth before trimming more! Trim only enough to clear the back of your mouth! 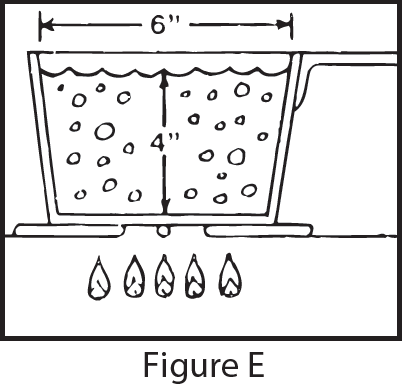 In a three-quart saucepan (or a pan at least 6″ in diameter and deep enough to hold 4″ of water (See Figure E) fill with water to at least 4″ depth. Bring water to a vigorous or rolling boil. Remove from heat and let water sit a few moments until the bubbling stops. 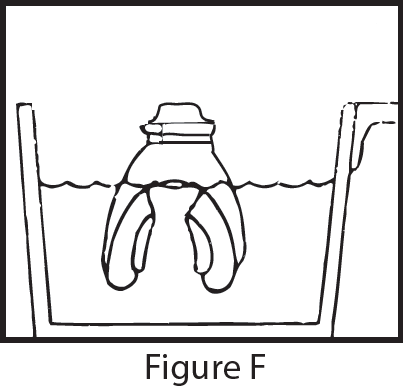 Holding the mouthpiece with the attachment and with the bite tips pointed down, submerge the bite portion into the hot water up to the top of the bite piece area (See Figure F). DO NOT PUT THE REGULATOR END INTO THE WATER! DO NOT IMMERSE THE ENTIRE MOUTHPIECE! Hold the mouthpiece in this immersed position for 25 seconds (do not heat the mouthpiece beyond the recommended time); remove from water. Press the outer edges of the bite wings against your teeth and gums. 1. BITE DOWN FIRMLY BUT D O NOT ATTEMPT TO BITE THROUGH THE MOUTHPIECE. 3. 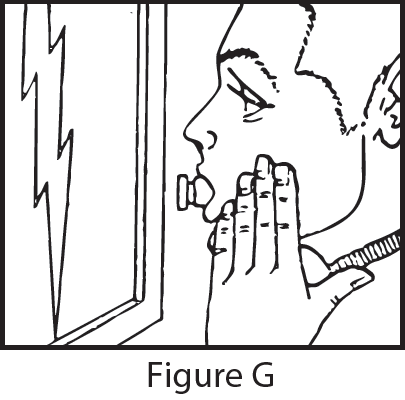 At the same time, press the outer edges of the bite wings against your teeth and gums by pressing your fingers against your cheeks (See Fig G). Relax, the SeaCURE mouthpiece is now custom-molded to your teeth and gums. 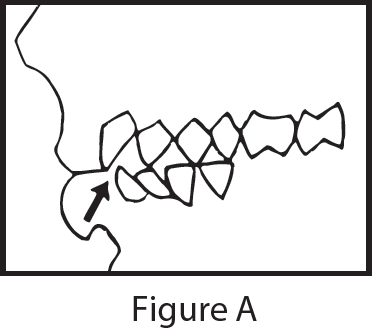 The bite wings should have deep impressions of your teeth and should conform to your gums. The SeaCURE Custom Mouthpiece is remoldable! IF you are not entirely satisfied with the initial fit, simply repeat steps 3-through-5, making sure the unit is cold (room temperature) before remolding. DO NOT REMOLD IMMEDIATELY FOLLOWING ANY PREVIOUS MOLDING WITHOUT FIRST THOROUGHLY COOLING THE SeaCURE MOUTHPIECE! Repeat as necessary to achieve a comfortable fit. This remolding process can be done at any time, should you have dental work done or, for any reason, your bite changes. Your personalized SeaCURE Custom Mouthpiece is now ready to be placed on your regulator, using the plastic tie provided. To install, put the mouthpiece – properly oriented (See Step 1) – onto the flange of your regulator. Place the plastic tie around the mouthpiece in the molded groove (See Figure H); tighten securely; cut off excess. To remove your mouthpiece from the regulator, grasp the lockbox of the plastic tie with a pair of cutting pliers, twist to remove the tie, then remove the mouthpiece from the regulator flange. The unique moldability of a SeaCURE mouthpiece, which provides the comfortable custom fit, results from its heat sensitivity. While the unit is particularly sturdy in normal use, some extra care is advised when handling your SeaCURE if it is subjected to excessive or prolonged heat.